Guilt Free Snacking with HungrySquirrel Co.
Food, just as with everything else in life, comes with a set of expectations. A lot of us rarely stray from our tried-and-tested favourites, especially when it comes to snacks. If you a find a good thing, why question it, right? HungrySquirrel Co. is here to tell you why. Rohan Kumar, the man behind HungrySquirrel Co., has been in the health and nutrition sphere of life for over a decade now. He founded his service when he saw the need for a service that was easily accessible to all, providing goodness that packed a punch. He’s making snacking satisfying, as well as nutritious. 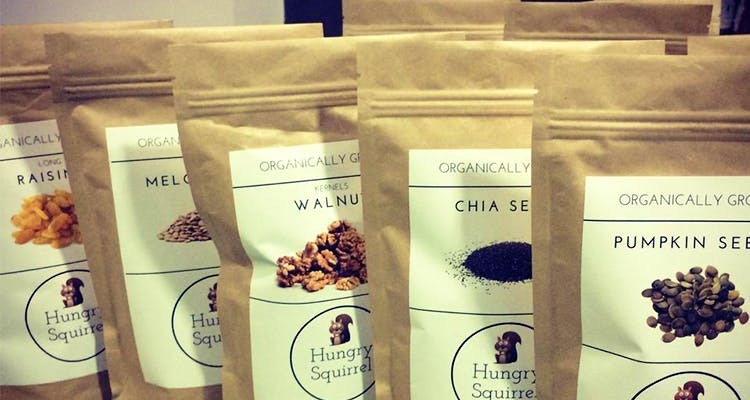 HungrySquirrel provides simple, clean packaged snacks full of a variety of nuts, trail mixes which are both sweet and savoury and a range of seeds. They’re starting muesli and energy bars soon, which we’re stoked about, seeing as how hard it is to get energy bars that are actually healthy. They’re making use of the goldmine that is Old Delhi to source all of their dry fruit, nuts and seeds. Their top priority is quality, freshly packaged and delivered. HungrySquirrel Co. isn’t just looking to distribute their snacks, they want to cultivate a lifestyle that incorporates healthy eating into their customer’s daily schedules. We’ve tried their trail mixes, and considering how hungry all this writing makes us, we’re so grateful for the guilt-free indulgence which, as it turns out, is doing great things to our systems. Each of their beautifully compact packages contains all the details of the ingredients, as well as calorie content. You’ll always know what you’re getting with them. Hunger pangs? Forget those greasy chips and turn to HungrySquirrel Co. to satiate your snack cravings. They do compact, brown paper bags of all sorts of nuts, seeds and dry fruits which won’t send you down a regret spiral once you’re done. All their stock is fresh, easily accessible online, and delivered right to you. Could it get any easier to be healthy? We don’t think so. Follow them on Facebook, here.